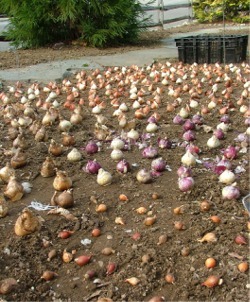 Check the planting instructions and plant each bulb to at least the proper spacing and proper depth as detailed. It is a good idea to dig 2" to 3" below the planting depth to loosen the soil to promote thorough root growth. The proper planting depth and spacing is most important for the health and vitality of flower bulbs, particularly those that are intended for perennialization and naturalization. To plant flower bulbs too shallow can expose them to damaging temperature spiking. Planting flower bulbs too close together can cause root systems to strangle each other or cause them to dehydrate or starve due to limited water and nutrition. The general rule of thumb is to cover the top of each bulb with 3" to 4" of soil, taking care to not break off any sprout growth. The existence, or amount, of fall top growth varies by variety. Muscari, Species Crocus and some Narcissus varieties may show some green top growth: this is normal, just plant them gently. Muscari and some Crocus may put up some top growth in the fall. This is natural. You may ignore it. Just don't apply mulch until after the garden surface freezes. You may refer to our Fall Mulching, or our Horticultural Tips sections on Tulips, Narcissi, Crocus, Hyacinths, Special Miscellaneous Bulbs, Herbaceous Peonies and Lilies.